When it comes to early note reading, creating positive first experiences for kids is key. 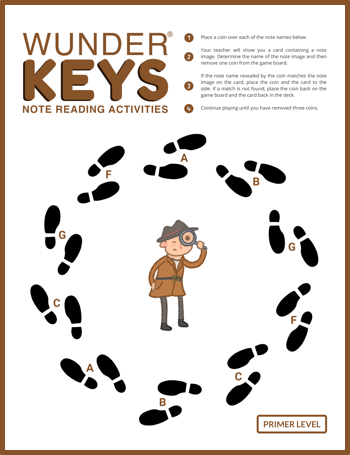 Will your piano students view note reading as easy and accessible or will they perceive it as difficult and frustrating? Based on how note reading is introduced, these first impressions can vary drastically. In today’s post we’re sharing a printable piano game that will help you create positive first experiences for piano students when introducing them to bass clef note reading in Middle C position. Today’s “musical mystery” activity (see download instructions below) packs a ton of educational fun into a no-prep package. It allows you to provide note-reading instruction while harnessing the power of play-based learning. When it’s time to introduce Bass Clef F-G-A-B-C in Middle C position, grab today’s game and have some fun reinforcing these notes before tackling them within the context of a piece. If you can spare five minutes your piano students will thank you with their smiles… and you’ll thank yourself when you realize that your future lesson time is not wasted on reviewing and reinforcing beginning note reading. To play today’s game, print out the game board, cut out the playing cards, and then follow the instructions below. Have your students place a coin over each of the note names below. Select a playing card and show your students the note image. Have them determine the name of the note image and then remove one coin from the game board. If the note name revealed by the coin matches the note image on the card, have your students place the coin and the card to the side. If a match is not found, have your students place the coin back on the game board and the card back in the deck. Continue to play until your students have removed three coins. We love creating professional, eye-catching printables that will “wow” the students and parents in your studio, while decreasing your prep time! As you know from previous posts, to make many of these new resources easy to find, and to correlate them with our new WunderKeys Primer and Level 1 books (coming later this year!) they can be found in the “Free Printables” section of WunderKeys.com. Today’s resource has been added to the Primer Section of the WunderKeys Resource Page. Click here or on the activity title page below to visit the WunderKeys Resource Page, and then scroll down to the Primer Section to find the downloadable pdf. 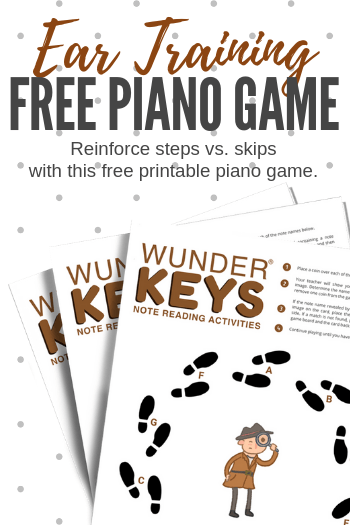 And while you’re there be sure to check out our completely revamped 2nd edition WunderKeys Preschool Piano books! Effectively Communicating The Importance of Summer Piano Practice to Parents – Use Our Template!